Lou Gehrig was the New York Yankees' first baseman from 1923 to 1939, playing in a then-record 2,130 consecutive games. The streak lasted until Cal Ripken, Jr. surpassed it in 1995. Gehrig had a lifetime batting average of .340 and won the Triple Crown in 1934. The Yankees won the World Series six times during his 17-year tenure with the team. 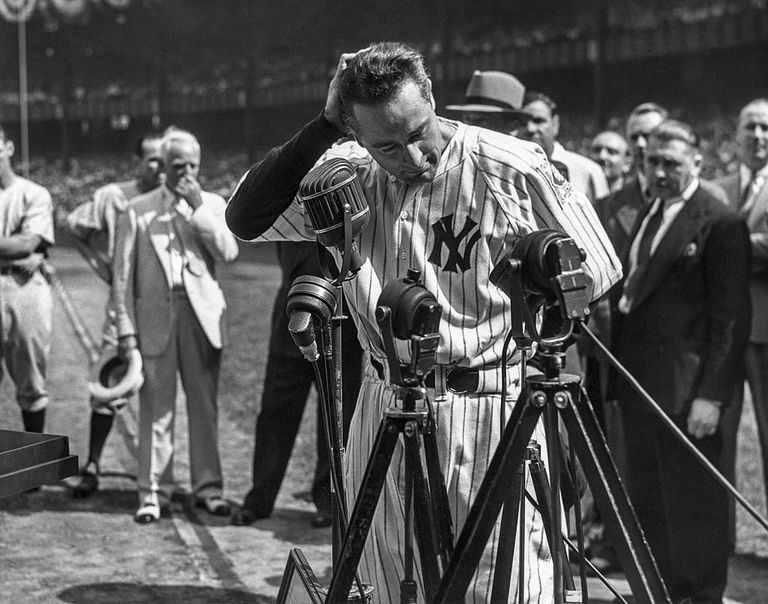 His farewell speech given on July 4, 1939, at Yankee Stadium (now known as Lou Gehrig Day) is considered the most famous speech in baseball history. The speech came just after Gehrig had been diagnosed with amyotrophic lateral sclerosis (ALS), commonly known as Lou Gehrig's Disease. ALS is a progressive, fatal, neurogenerative disease that affects an estimated 20,000 Americans every year, according to the ALS Association. "Fans, for the past two weeks you have been reading about the bad break I got. Yet today I consider myself the luckiest man on the face of this earth. I have been in ballparks for 17 years and have never received anything but kindness and encouragement from you fans. Look at these grand men. Which of you wouldn't consider it the highlight of his career just to associate with them for even one day? Sure, I'm lucky. Who wouldn't consider it an honor to have known Jacob Ruppert? Also, the builder of baseball's greatest empire, Ed Barrow? To have spent six years with that wonderful little fellow, Miller Huggins? Then to have spent the next nine years with that outstanding leader, that smart student of psychology, the best manager in baseball today, Joe McCarthy? Sure, I'm lucky. When the New York Giants, a team you would give your right arm to beat, and vice versa, sends you a gift - that's something. When everybody down to the groundskeepers and those boys in white coats remember you with trophies - that's something. When you have a wonderful mother-in-law who takes sides with you in squabbles with her own daughter - that's something. When you have a father and a mother who work all their lives so you can have an education and build your body - it's a blessing. When you have a wife who has been a tower of strength and shown more courage than you dreamed existed - that's the finest I know. So I close in saying that I may have had a tough break, but I have an awful lot to live for." In December 1939, Gehrig was elected to the National Baseball Hall of Fame. He died less than two years after giving his speech, on June 2, 1941, at age 37.
Who Are the Top Relief Pitchers In Baseball History? Who Are the Top Shortstops of All Time?